I feel like the past couple weeks have been a delicate balance between getting everything finished before the baby comes and enjoying our time together as a family of four! I was getting a little worried last week when I started having contractions and have not finished the more essential baby stuff, so yesterday I whipped up a few things for my diaper bag and now I feel almost ready. Silly, I know - this stuff really doesn't make that much difference! 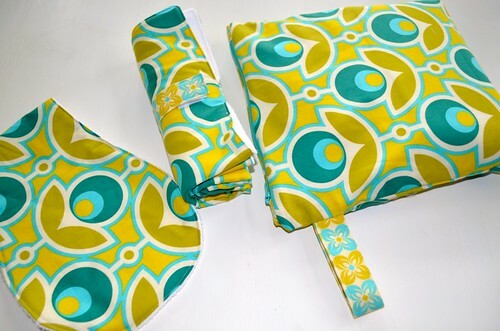 I made a coordinating burp cloth (I've always like to make them this shape to fit over your shoulder nicely), a roll up changing mat (both backed in terry), and a wet bag filled with my diapering supplies. 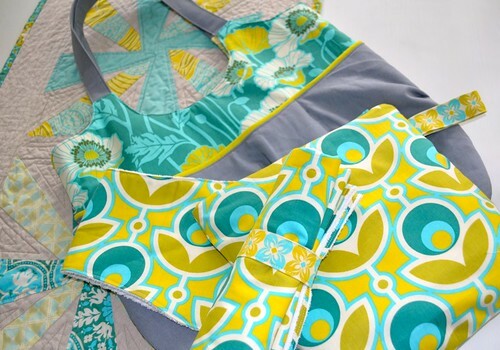 The fabric is from Joel Dewberry's Notting Hill line in the teal colorway. 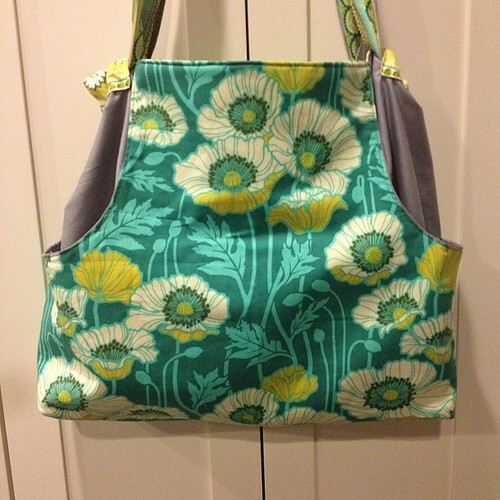 So it looks great with my Anywhere Bag (from Noodlehead) shown above or my Multi-tasker Tote below. I also did a little sewing for around the house. We are in the process of converting our previously barren living room into a family studio/office space. I decided to put most of the budget into a new couch for our family room, where we spend a lot of time, and move the old, pretty worn out couch into the living room. This was instead of making a formal living room with fancier furnishings. We decided we just wanted a usable, real space to enjoy. You can see my pinterest board with my ideas here. The new family room couch arrived, so we moved this one into it's new space. I was having a hard time finding fabric that used the pale, spa/aqua color of those linen drapes with some brighter colors I wanted to make it more fun. Enter Target and their awesome Threshold line. I whipped these pillows out of dish towels! This weekend also marked a big milestone for my husband's side of our family. His grandfather turned 95! He is as sharp as ever. He drove to his own party (yep, he took his test at the DMV last year and was happy to find he is good until he turns 98, what!?!?). He is really amazing, from his 70+ year marriage to Andrew's grandmother, World War II service intercepting and decoding u-boat messages, running a clothing factory that employed 700 people (and making sure they all still had a job when he sold it and retired), and continuing his education by attending and giving lectures on all manner of things. I think I am most impressed by the fact that he was at Southpark Mall last month, walking for exercise, and spotted Andrew's lifelong friend who now lives in New York across the way. He had not seen him in a few years, and I couldn't believe he would recognize him out of context. He went right up to him and said "Casey, aren't you supposed to be in Manhattan?" To live such a life and still be so crisp at 95! So, sorry for all the rambling, just lots to catch up on! Very excited for you to welcome Little Lyon #3! Can't wait to see pictures when he makes his arrival! Looking forward to the baby pictures!